Jeffrery Brown, Brett Warnok and I will be signing, sketching at the Top Shelf booth at The Toronto Comics Art Festival this weekend. 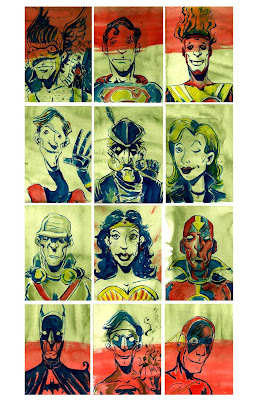 I will also be selling a load of new paintings, my Tales From The Farm Cut-Out Dolls and this new print of the Justice League. Coinicidentally, I have also launced an Online Store at jefflemire.com, selling all these things, and my original artwork from lost Dogs and Tales From The Farm!